BMW 340i m performance Exhaust (2018). Taken from my 2016 340i. Bought new and fitted in Autumn 2018. Includes M Performance style carbon tips (reps). Transforms the sound of the car. Grab a bargain as these are serious money new. Posted Royal Mail 1st Class signed for. BMW 525/530D Decat Pipe. This is a performance part and a upgrade to the orginal system. Stainless Steel T304, Straight Swap Over . Pipe work made from T304 Tube, will not rust with heavy duty mild steel flanges. At obsidian motorsport we pride ourselves on level of quality of our products Deeper exhaust note. 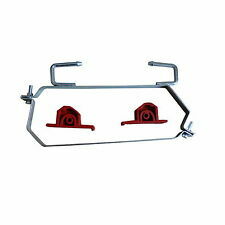 Discrete, high strength bracket. Premium standard stainless steel – no rusting like cheap alternatives. 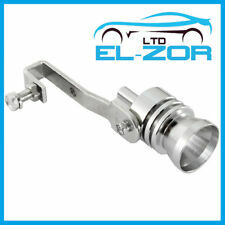 These are free flow unrestricted stainless steel exhaust back boxes. BMW X5 STAINLESS STEEL PERFORMANCE BACK BOX PAIR. Quality grade stainless steel. BOX LENGTH - 152mm. BOX WIDTH - 210mm. BOX HEIGHT - 133mm. 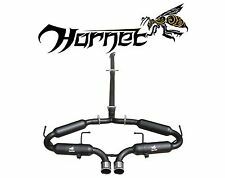 This exhaust system has been mainly developed for race/competition purposes. 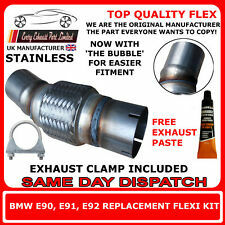 BMW 3 series 320d 318d E46 catalytic converter flexi exhaust repair flex pipe. BMW 320, 318 Exhaust Catalyst Flexi Repair. Save over £400 by using flexi and keeping your original cat. This is a clamp on flexi. High Quality Interlock flexes used for long lasting wear and tear. 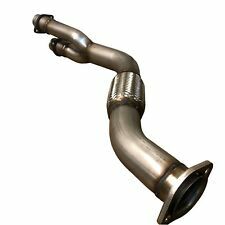 BMW 3 SERIES E90 DECAT DOWNPIPE DPF OFF 2005-2008. The factory catalytic converter in the downpipe is a major cause of exhaust flow restriction. By replacing the factory downpipe/catalytic converter with our high flow decat downpipe, more power is available when you want it. MINI Cooper 1.6i Cat 16v Hatchback, Cabriolet 1598cc (85 kW, 114 HP), Eng:W10B16A. OBD 01/2001-11/2006. Mini Cooper. Exhaust Rubber Mount x 2. Exhaust Mounting Rubber. Add to Favourites. BMW M4 F82 F83. BMW M3 F80. BMW M2 F86. Made from Stainless-Steel and Carbon Fiber. Ensuring you receive the greatest carbon products possible. BMW E46 3.2 M3 COUPE & CONVERTIBLE 1998-2005. Stainless Steel Exhaust Muffler. Scilly Isles & Isle of Man. Buy more and Save more. Parcelforce Global Priority. Bulgaria ,Canary Island, Estonia, Gibraltar, Latvia, Malta, Romania. Bmw M3 E36 Blueflame Stainless Backbox. Condition is Used. Dispatched with Other Courier (3 to 5 days). 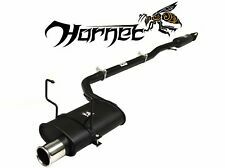 Cobra Resonated Sports Exaust - BMW M140i NEW! BMW M5 F10 EXHAUST, taken from a 2015 F10 M5 when exhaust was upgraded and been collecting dust in my garage. Will upload better pictures shortly or message me for more details. Comes complete from the front to the back without cats. Cheapest used exhaust in the country so don't try and haggle on the price. Winning bidder must pay £100 deposit within 24hrs and pay rest on collection. 2.5TD and 3.0TD Saloon and Estate Models, 2003-2007, Engine: M57N, Typ: E60 and E61. BMW 525 D 2.5TD DPF Cat Turbo Diesel Saloon, Estate 2497cc (132 kW, 177 HP), Eng:M57N. Typ:E60,E61. Save money replacing your old worn out front pipe, down pipe or cat pipe with this flexi pipe. BMW Mini One and Mini Cooper 1.6 Silencer Strap. We are incredibly proud of the quality and build of our products. We are a small, dedicated and friendly family run firm. No Need To Replace Your Exhaust. bmw m3 e46 backbox exhaust . Condition is Used. Collection in person only. Also removes the restriction on the original pipework where it goes over the centre brace. BMW 318D / 320D Centre silencer delete pipe. BMW 318D / 320D E90 / E91 / E92 - 2005 >. Easily remove the front silencer on your BMW 318D / 320D standard exhaust system to give extra performance and a sportier note. As you probably know the primary cars are a huge restriction in the E9X M3 exhaust system. These are designed to simply replace the OE cats and are an easy DIY install as this uses a slip on clamp design. BMW 3 SERIES E46 3.2 M3 1998-2005 STAINLESS STEEL QUAD EXHAUST BACKBOX. This item is used but in perfectly working condition. Condition is Used. B e c a u s e o f t h e s i z e i t i s p i c k u p o n l y f r o m s p e e d m i n i s t r y a t M a l l o r y P a r k r a c e c i r c u i t Leicester L E 9 7 Q E.
BMW M3 EXHAUST E92. Condition is Used. Collection in person only. 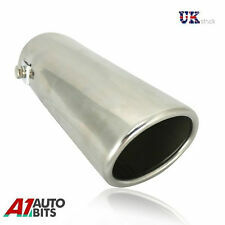 GENUINE BMW F87 M2 EXHAUST 7854717 QUAD EXHAUST - 2017. From a 2017 BMW M2. Can fit onto a M235i with modifications.